The situation in the ATO zone is relatively stable. Over the past day, six Ukrainian servicemen were wounded in combat in Donbas. The situation in the ATO zone remained tense, but relatively stabilized on Sunday. The Russia-backed terrorist forces 49 times opened fire on the ATO positions all along the contact line. In the coastal sector, the militants 20 times opened fire on the positions of the ATO forces. After 18.00 Kyiv time one of the strong points in the area of Vodyane the enemy fired 120- and 82-mm mortars. Militants periodically fired at the ATO units stationed in the areas of Shyrokyne, Hnutove and Novotroyitske from small arms. Near Pavlopil they used grenade launchers and heavy machine guns, and IFV weapons at Talakivka, ATO headquarters said in a Monday report. 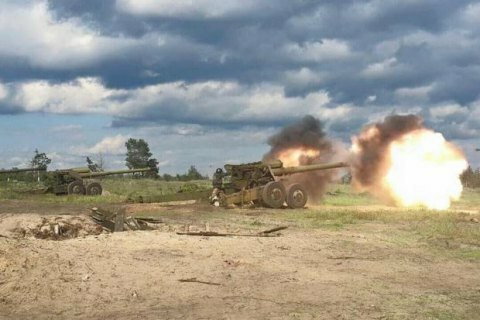 In the Donetsk sector, the pro-Russian terrorist groups shelled Ukrainian military in the area of Avdiyivka. With the onset of darkness, militants used 120- and 82-mm mortars and light weapons. From 82-mm mortars, grenade launchers and small arms, the illegal armed formations fired at the defenders of Luhanske. In the area of Novhorodske, the enemy shell used heavy machine guns and small arms. In the Luhansk sector, militants used weapons on nine occasions. In the evening, Russia-backed terrorist troops shelled Troyitske with 82-mm mortars. The ATO positions in the area of Stanytsya Luhanska were under heavy machine gun fire. The same weapons plus grenade launchers were fired at Valuyske. On May 13, four Ukrainian soldiers were wounded in Donbas. In Avdiyivka, four civilians died in the courtyard of at apartment building were killed by an artillery shell and another was seriously wounded and hospitalized.